Keeping your canine healthy and happy is crucial for any pet owner, and keeping their teeth clean is one part of that. Of course, keeping your dog’s teeth clean isn’t as simple as you might think. That’s why it’s important to have the best dog toothbrush for sale. You’ll be able to feel comfortable using it and your dog will feel better about the process too. We’ve created this dog toothbrush buying guide to help you with the process of choosing just the right one. Type: How do you hold the brush to make sure that you’re getting your dog’s teeth clean? Does it go in your hand or over your finger or attach some other way? You probably have a preference for how you prefer to do it. Pieces: How many items are included in the brush you’re buying? Are there extra pieces there? Or maybe the toothbrush itself needs to be assembled. You want to know what’s going to come in that pack for you. Toothpaste Included: Does the brush come with everything you need to get started, including the toothpaste? Do you need to spend a little bit of extra money in order to get everything that you need or buy it somewhere else? Soft Bristles: Are the bristles on the brush going to be soft for your dog or are they a little harder? This one may be about personal preference because you may need something a little harder for larger dogs (but not too hard of course). Size: Just how big is the brush? Is it designed for larger dogs or for smaller ones? Is it something that you could use for both? You’ll need to know so that you can prepare for what else you may need to buy. Dual Head: Does it have more than one headpiece? Is it going to get a better job cleaning? Just like the dual head features on your own toothbrushes you’re definitely going to get some great purpose out of this one. There are plenty of different options for dog toothbrush toy and more out there but you want to make sure you have something your dog will feel comfortable with and that you’re comfortable with. We’ve narrowed things down a bit to give you our top 10 dog toothbrushes so you can start your list a little easier. These dog toothbrush reviews are definitely going to start you in the right direction. 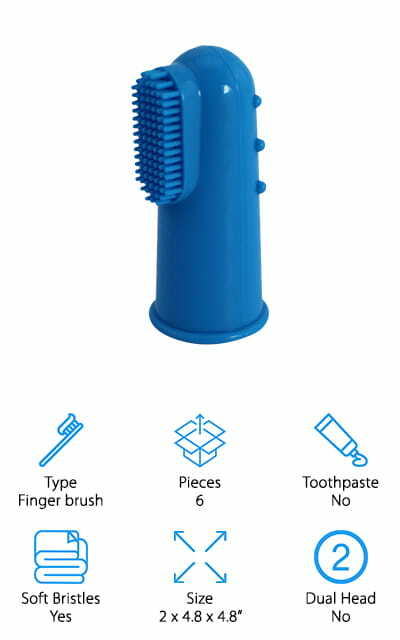 Our top pick is this super simple hygiene kit that features a dual ended toothbrush with soft bristles to treat your dog’s teeth gently. 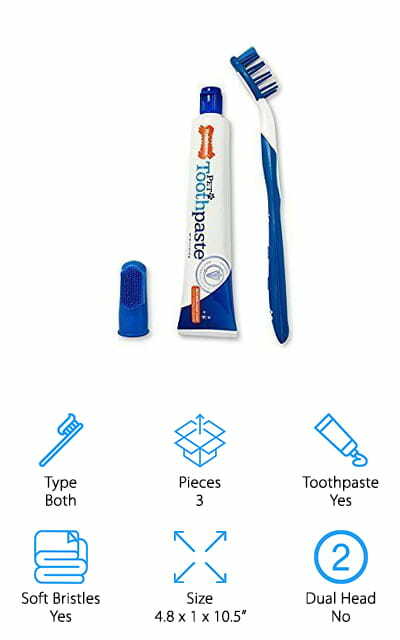 The best dog toothbrush and toothpaste, it has a finger brush design that slips over your finger easily so you can get in close and it’s completely safe for all pets. In fact, it even comes with its own toothpaste that’s made to taste like chicken and is totally safe to be swallowed. This brush may look really simple, but that’s because it is and it still gets the job done right. The softer surface of this system is great for daily brushing and helps to massage and strengthen the gums of your teeth. Everything you need is included in this single set, which means you can get started as soon as you get it. Not to mention you can help your pet feel a whole lot better (and improve their breath too). Our budget pick is a simple option that comes in several different styles that are designed for puppies, cats, adult dogs and senior dogs. It’s a small dog toothbrush that’s made by a company that’s known for dog products and it has a more traditional toothbrush design. The larger brush has an angled neck that makes it easier to get all of your dog’s teeth and there are nylon bristles that help get between the teeth as well. Complete with a finger brush to get in even the smaller areas and a toothpaste made with products to reduce plaque, it’s something your dog won’t mind. This kit helps get your dog some fresh breath and healthy teeth and gums. Everything you need to get started is right here and even more skittish or hesitant dogs will be willing to give it a try, especially when they taste the toothpaste and feel the ultra-soft bristles. 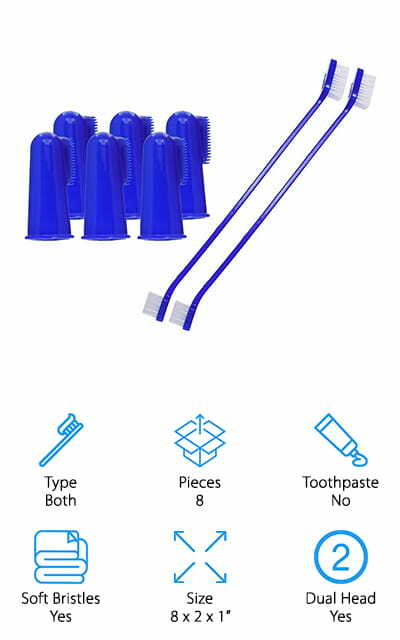 This set of finger brushes is the best cheap dog toothbrush and still provides you with all of the features that your dog (or cat) will need. 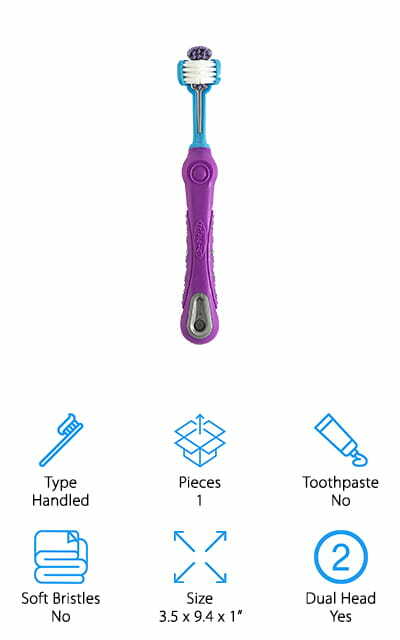 You get 6 finger toothbrushes included in the set with the option for larger or smaller brushes depending on the size of your pet. All you have to do is slip one on over your finger and you’ll be ready to get started, which can help with those pets that are a little skittish about having their teeth cleaned. The soft bristles make it great for transitioning pets to more frequent brushing and you can feel comfortable using it with your pets because it’s made with food grade materials. There’s a 60 day money back guarantee that says if you’re not happy you can return it for a full refund for any reason. What’s really neat with this company is that 15% of the profits from the sale of their products goes to the American Animal Rescue Society to help take care of abandoned dogs and cats. This unique looking tiny dog toothbrush (or larger dogs) actually comes in 2 different sizes for large or small breed dogs. It has 3 different heads that are flexible and completely independent of each other, which makes it much easier to clean all sides of your dog’s teeth and gums more quickly. That’s definitely going to be a good thing when your dog doesn’t really want to continue with the process. 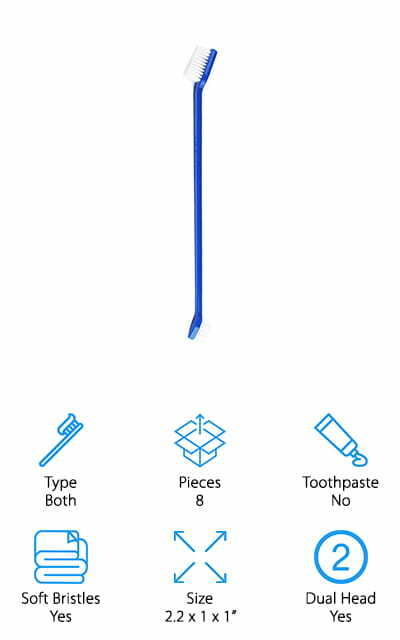 There’s even a tongue cleaner at the bottom of the handle and that handle has an ergonomic design to keep it comfortable for you. Manufactured in the USA, you’re only going to need your favorite toothpaste for dogs and you’ll be ready to go with this brush that can help to ward off bad breath as well as gum disease. This small brush is still able to get a lot done and that’s important when your dog is so important to you. 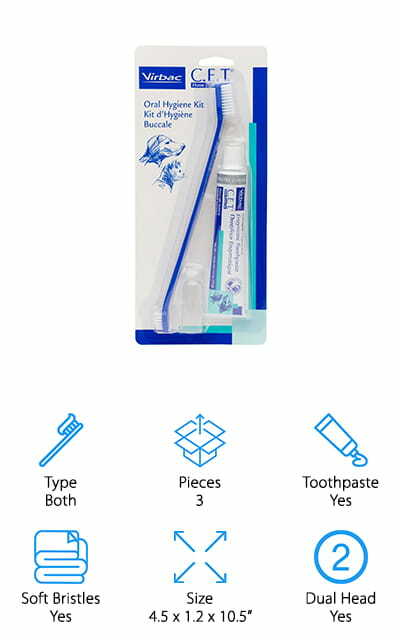 This is an inexpensive kit that comes with the toothbrush itself and a toothpaste that’s formulated by veterinarians. The toothpaste itself uses aloe, neem oil, baking soda, enzymes, and grapefruit seed extract to create a healthy and fresh product that you won’t mind and your pet definitely won’t mind. It also has a triple-head toothbrush that can get into several areas of your dog’s mouth at the same time to make sure you’re getting it clean. This system is easy to use and comes with everything you need, plus it’s made in the USA. The toothpaste is ultra-safe and can be used with the toothbrush itself, on your finger for direct teeth application or on their tongue to promote fresher breath. All you have to do is decide how you’re going to use it and you and your pet will be ready to go each and every day. Here you’re getting a whole lot of pieces for one low price. 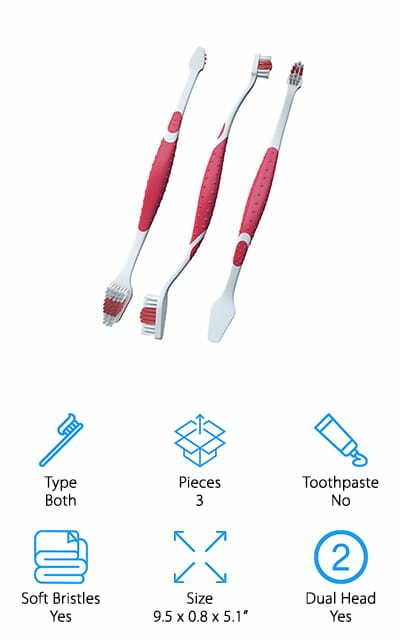 You’ll get 6 finger brushes as well as 2 dual headed toothbrushes that come on long handles. 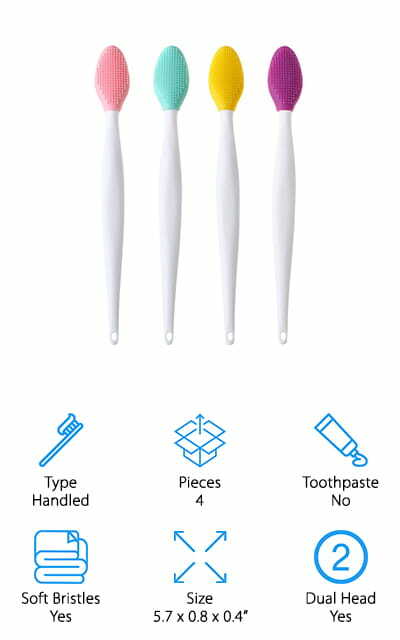 Designed to be used with cats or dogs, these toothbrushes work great for getting through the entire mouth and all of the teeth. The soft bristles feel great on your dog’s teeth and gums and they’re made with high quality products to keep your pets safe. Even better, you have a satisfaction guarantee that says you’re going to love these products or you can get your money back. 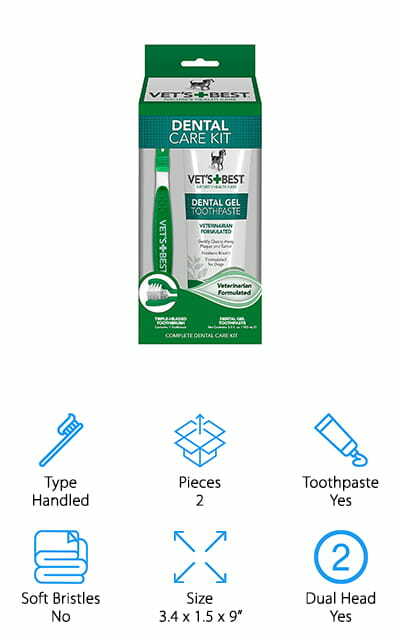 This easy to use system gives you a little of everything you’ll need to get in close on your pet’s teeth, though you will need to pick up your favorite pet toothpaste to go along with it. You also get the ability to help your pet feel more comfortable and get used to the idea of teeth brushing and more. Here you get a set of 8 finger brushes that will help you get really close for a great clean. They slide over your finger easily and the bristles actually wrap part way around the finger to give you more cleaning space and a faster cleaning process. It comes in different sizes to ensure a better fit for you so you don’t need to worry about your pet while you’re cleaning. Even better, it has a 60 day money back guarantee so if you’re not happy with the product you can get your money back. When you do make a purchase from the company you can also feel even better, knowing that 15% of the profits from the purchase are going to Hope for Paws, which is a non-profit animal rescue. Ideal for medium to large dogs that are 10 pounds or more, these brushes are simple to use and fit owners with ring size 7 and up. With this set, you’re getting 4 finger brushes as well as 4 handled brushes that offer dual heads. The brushes themselves are made with food grade materials so you can feel comfortable providing them to your pet and they’re inexpensive. With this set, you get 3 different sets of bristles for different strengths and capabilities. No matter what, however, you’ll have an easier time getting rid of plaque and tartar buildup. If you’re not happy with the brushes for your dog or cat you can take advantage of the 100% satisfaction guarantee that comes with them. Available in bright colors, you’ll have no problem with the soft silicone that is completely free of dangerous chemicals and FDA approved. All you need to do is slide the finger brush over your finger or pick up one of the handled options and you’ll be able to get started just like that (with your favorite pet toothpaste anyway). This set offers a stylish system that your pet is definitely going to like and so will you because of the comfort that it offers while you’re using it. The dual head brush has an ergonomic style grip that keeps your hand from slipping and you’ll get 2 finger brushes to go along with it. They provide different types of bristles to help get into the harder to reach spots on their teeth and gums and you’ll even get free toothpaste recipes so you can make your own. 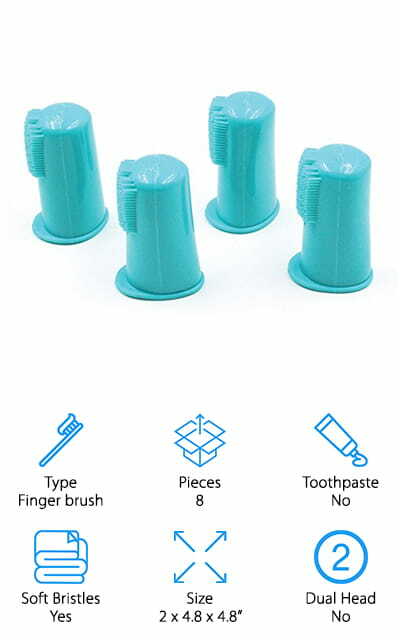 The finger brushes in this set have a unique design that makes them easier to get on and off and also helps you to keep your dog’s teeth as healthy as possible. You’ll be able to easily brush your dog’s teeth daily with these brushes in your home. Finally, we have these unique brushes that provide you with a curved handle and a silicone ‘brush’ to get your dog’s teeth and gums clean. The brushes are made of rubber, which makes them super soft on the gums and they have dual sides with different types of ‘bristles’ to get rid of tartar and plaque. The brushes come in different thicknesses, which helps with different parts of the teeth and mouth and they have plenty of space to reach the curve of the gums. Designed in fun colors, these brushes can work for your dog, cat or even many other pets. Small enough to hold easily, they will get all the way to the back of their mouth and help cut down on infections, bad breath, and gum disease, making it the best toothbrush for small dogs.